Norway has launched the innovative AISSat-1 spacecraft to monitor shipping in its territorial waters. The small satellite will track vessels over 300 gross tonnes by picking up the signals from their AIS (Automatic Identification System) transponders. AIS is a safety and navigation tool, and can be used by the authorities near the coast to keep watch on cargo, passenger and fisheries activity. AISSat-1 will enable Norway to see what is happening over a vast area. "Norway has the largest sea area to manage in Europe, and this area is the source for a lot of Norwegian income, from oil to fisheries," explained Bo Andersen, the director general of the Norwegian Space Centre. "We want to manage these resources in the best possible manner; and we do that now with radar satellites that give us quite a good overview about where ships are. But they don't give us knowledge about which ships they are. "Of course, the fisheries authorities and the coastguard can go out in aeroplanes and check the ships, but we are talking about an area that's bigger than the Mediterranean. So we want a more efficient system." The nano-sat - it is a 20 by 20 by 20cm cube - was one of five payloads launched on an Indian Polar Satellite Launch Vehicle from the Sriharikota Spaceport in Andhra Pradesh. 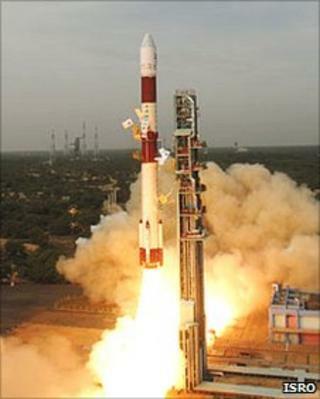 The primary payload was India's 700kg Cartosat-2B, a high-resolution imaging spacecraft. Mr Andersen confirmed that the Norwegian mission team had successfully made contact with AISSat following its separation from the rocket. AIS data is transmitted via a VHF signal and identifies the ship, its position, course, and speed. Norway has already demonstrated how this information can be picked up from orbit. A receiver called NORAIS was recently installed on the International Space Station (ISS), and plotted the movement of ships around the globe. NORAIS is part of a project that could eventually lead to a space-AIS solution for the whole of Europe. Norway is keen to stress, however, that AISSat-1 will be keeping watch over its national waters only. "AISSat-1 is a simple demonstrator," Mr Andersen told BBC News on Monday. "If it works, it will be put into operation and we may launch new ones, also. "Right now, it seems everything is working as planned and we will use the next few days to check out its systems. Then we'll turn on the instrument and I expect we'll get the first AIS data quite soon, in one to two weeks." At a recent Earth observation symposium in Bergen, Trond Giske, the Norwegian space minister, said he was hopeful AISSat could develop into an ongoing operational system. "If this is successful, we will definitely look into doing another one; we will consider that strongly," he told reporters. The spacecraft's 600km-high polar orbit means it will get sight of Norway's economic zone every 100 minutes. The 4.4m-euro (35m Kroner; £3.7m) satellite has been funded by the Norwegian Space Centre. The satellite bus, or chassis, was provided by the University of Toronto, Canada. The payload was developed by Kongsberg Seatex AS in co-operation with the Norwegian Defence Research Establishment (FFI).